It’s time we reclaimed Australia. Because I love this country and I hate to see it being sullied by bigotry and racism. I’ve got a simple message for those people who think it’s acceptable to rally in capital cities on Easter Saturday in order to send a message about their hatred and intolerance of people who are different from them. You are not the type of Australians I want in our country. Of course I would never tell you that you must leave, and of course I wouldn’t imply that you should be forcibly removed. 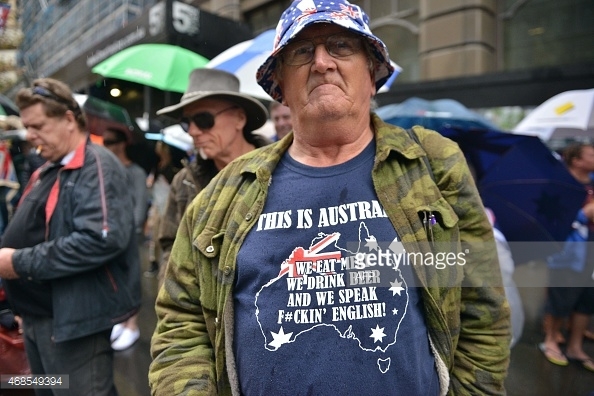 No, this is just advice: if you are really so angry about Australian society that you feel the need to protest against it, it’s obvious you don’t belong here. And if you’re not happy, why don’t you find somewhere else to live where you do belong? I love Australia’s multiculturalism. As a fifth generation Australian with ancestors from England and Ireland, I know enough about the country’s history to understand that we have always been a multicultural nation. The indigenous population have, in my view, the only right to complain about the way in which this multicultural society was formed. Because they were the victims of a murderous takeover by the first settlers and this is the part of our history I am most ashamed of. However, since then, I think Australia’s done a fairly good job of being an inclusive, open, welcoming country, and I personally think it’s the best place in the world. That’s why I would prefer that racists and bigots remove themselves, voluntarily, from this great country, because its greatness is lessened by the attitudes this minority holds. Like any great country if Australia rests on our laurels, and tolerates a vocal minority’s campaign to make other peaceful, Australia-loving minorities feel unwelcome, we have all failed our society. We have a Prime Minister currently who doesn’t value our multicultural society and all those who contribute to it, so it’s no wonder that the racists and bigots think they have permission to make their intolerance known. But don’t be tempted to follow the lead of the petty people, the leaders like Abbott who use anger and fear to make himself feel good. Don’t give in to hatred. I am not so naive to think that this wonderful Australia we live in isn’t damaged in the eyes of the world by the way our population, in the majority, treats new immigrants, particularly desperate people seeking asylum. It embarrasses me that so many Australians, living comfortable, privileged lives, would slam the door in the face of those looking for safety. It’s almost as if some Australians resent our culture because it is exactly the type of place that other people aspire to live. Would they prefer Australia was the type of country people wanted to get out of? Would they prefer our standard of living was a turn off? We are, on the whole, a safe, harmonious, wealthy and well educated country, with a beautiful climate and a laid back and friendly culture. I appreciate living here. One of the things I love most is that we aren’t all the same; it’s the multi in multiculturalism which makes this country interesting. I’m not just talking about a range of cultures that contribute a choice of cuisines, fashions, architecture, music, and cultural entertainment; it’s also the mix of ideas, the different perspectives and the drive all of us have to make Australia a better place. We want to make Australia better because we all love this nation. No matter if people have lived here for five generations or one, or if they’ve just arrived and they’re not planning to live here forever; we’re here because we love it. But it’s clear some of us love it more than others; why else would people feel the need to protest in the streets? So this is my message to those who don’t love living here. Don’t try to change Australia because you don’t like it. Either accept Australia for what it is, and embrace this great country, or consider leaving. Perhaps you would be happier in a country that doesn’t have Australia’s rich multicultural society, where everyone is as distrusting, arrogant, rude, judgemental, racist, small-minded and hateful as you are. Perhaps you will be better off without us, just as we would be better off without you. Thank you Victoria for your Easter freedom message. Howard and Abbott will never be able to fill the footprints that Malcolm Frazer has left regarding refugees Although those Vietnam refugees were so much a part of Australia’s military commitment for we were their allies in their failed freedom bid for those citizens. So what is the difference between those fleeing persecution under the religious banner of Islam got to do with those who fled Communist North Vietnam. Simple answer, freedom has been stripped from them by a murderous regime, who wouldn’t hesitate in killing them for the simplest wrong or fabricated evidence in their judgement. I have always thought that the White Australian Policy still lingers within most Australians. Well some of them anyway is why Abbott has played this fear well among the electorate and almost all of them had fell for his crap. Another good article and have a good Easter. This isn’t racism, its a desire to keep our lifestyle, at the rate they reproduce we could be a Muslim nation in 50 years. Bit late responding Victoria. Buy yes if they are not happy then go somewhere else.